Bust of Brillat-Savarin in Belley, France. Jean Anthelme Brillat-Savarin (1 April 1755, Belley, Ain – 2 February 1826, Paris) was a French lawyer and politician, and gained fame as an epicure and gastronome: "Grimod and Brillat-Savarin. Between them, two writers effectively founded the whole genre of the gastronomic essay." Brillat-Savarin was born in the town of Belley, Ain, where the River Rhone separated France from Savoy. He studied law, chemistry and medicine in Dijon and practiced law in his hometown. He was born Jean Anthelme Brillat, but adopted his second surname because an aunt named Savarin left him her entire fortune on the condition that he adopt her name. In 1789, at the start of the French Revolution, he was sent as a deputy to the Estates-General that soon became the National Constituent Assembly, he became well lknown for some of his speeches, particularly one supporting capital punishment. He returned to Belley and was for a year the elected mayor. At a later stage of the Revolution there was a bounty on his head, and he sought political asylum at first in Switzerland. He later moved to Holland, and then to the new-born United States, where he stayed for three years in Boston, New York, Philadelphia and Hartford, living on the proceeds of giving French language and violin lessons. For a time he was first violin in the Park Theater in New York City. "Madam, receive kindly and read indulgently the work of an old man. It is a tribute of a friendship which dates from your childhood, and, perhaps, the homage of a more tender feeling...How can I tell? At my age a man no longer dares interrogate his heart." Title page of "La Physiologie du Goût" ("The Physiology of Taste") by French gastronome Jean Anthelme Brillat-Savarin (1755-1826) with a portrait of the author. 1848 edition. Brillat-Savarin cheese, the Savarin mould, a ring mould with a rounded contour, and Gâteau Savarin are named in his honour. His reputation was spread to a wide television audience by Chairman Kaga of the TV series "Iron Chef" which introduced to millions the quote "Tell me what you eat, and I will tell you what you are." Brillat-Savarin is often considered as the father of low-carbohydrate diet. He considered sugar and white flour to be the cause of obesity and he suggested instead protein-rich ingredients. Sure enough, carnivorous animals never grow fat (consider wolves, jackals, birds of prey, crows, etc.). Herbivorous animals do not grow fat easily, at least until age has reduced them to a state of inactivity; but they fatten very quickly as soon as they begin to be fed on potatoes, grain, or any kind of flour. ... The second of the chief causes of obesity is the floury and starchy substances which man makes the prime ingredients of his daily nourishment. As we have said already, all animals that live on farinaceous food grow fat willy-nilly; and man is no exception to the universal law. Brillat-Savarin, Jean-Anthelme (1970). The Physiology of Taste. trans. Anne Drayton. Penguin Books. pp. 208–209. ISBN 978-0-14-044614-2. Eneas Sweetland Dallas wrote Kettner's Book of the Table, a Manual of Cookery, 1877, a treatise on gastronomy based on the work of Brillat-Savarin. Dallas published his book under the pseudonym of A. Kettner. He compared after-taste, the perfume or fragrance of food, to musical enharmonics (Meditation ii): "but for the odour which is felt in the back of the mouth, the sensation of taste would be but obtuse and imperfect." An avid cheese lover, Brillat-Savarin remarked: "A dessert without cheese is like a beautiful woman with only one eye." "The discovery of a new dish confers more happiness on humanity, than the discovery of a new star." "A man who was fond of wine was offered some grapes at dessert after dinner. 'Much obliged,' said he, pushing the plate aside, 'I am not accustomed to take my wine in pills.'" "To receive guests is to take charge of their happiness during the entire time they are under your roof.'" "Cooking is one of the oldest arts and one that has rendered us the most important service in civic life." "The pleasure of the table belongs to all ages, to all conditions, to all countries, and to all areas; it mingles with all other pleasures, and remains at last to console us for their departure. ↑ Stephen Mennell, All manners of food: eating and taste in England and France from the Middle Ages to the Present, 2nd ed. 1996, p. 267. ↑ Quoted by Anne Drayton, Introduction to The Physiology of Taste, 1994, p. 11. ↑ "The physiology of taste, or, Meditations of transcendent gastronomy; a theoretical, historical and topical work, dedicated to the gastronomes of Paris by a professor, member of several literary and scholarly societies"
↑ Mennell, 1996, p. 268. 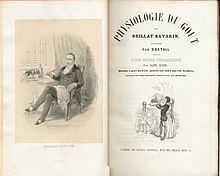 La Physiologie du goût Original French text of the 1848 illustrated edition of The Physiology of Taste; a freely licensed copy hosted on the Bibliothèque nationale de France's digital library, Gallica. The Physiology of Taste In an English translation by Fayette Robinson, available under a free licence from the University of Adelaide Library. This page was last changed on 13 January 2019, at 19:47.